Welcome two- and four-legged guests to your home with this dirt-trapping doormat. 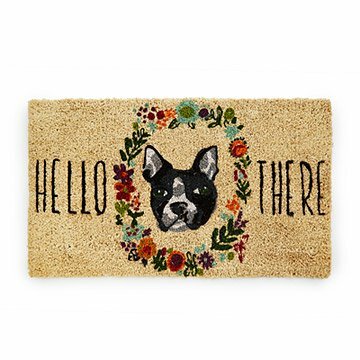 When you need the opposite of a Beware of Dog sign, this welcoming doormat lets visitors know to expect some vigorous tail-wagging upon entering–and serves as a gentle reminder for guests to wipe their feet. Eco-friendly and biodegradable, this stylish mat will look its best if it's kept safe from the elements in a covered area. Made in India. Perfect gift for Boston Terrier lovers! Threat thick mat will be great outside. It sheds a bit. The image is exactly as the picture shows. It was so cute but not practical. This rug not only added a cute touch to our door but is also very functioning. We got this mat as a wedding gift. We thought is was very cute when we first got it and we were very excited to use it. We put it outside our back door on our patio where it is protected by a little bit of an overhang but does occasionally get wet. The first time it rained a little bit the mat turned a much darker brown where it had gotten wet (see the picture). We have now been using it for about a month and it has gotten so dark and worn that you can barely see the pattern on it at all (see the picture). It looks like we have had it for many years, not just a month. We were very disappointed.